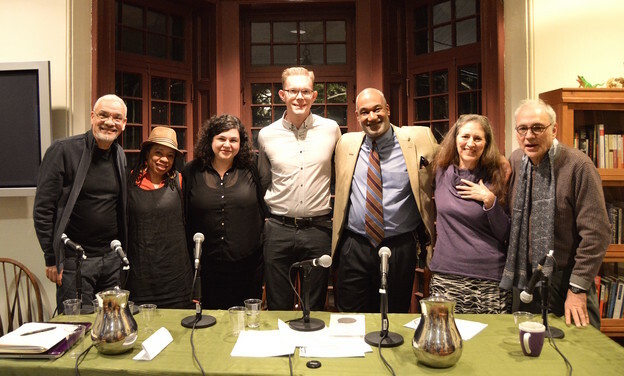 To celebrate the one hundredth episode of PoemTalk — the series began in 2007 and is ongoing — producer and host Al Filreis convened seven poet-critics who had participated in previous episodes: Herman Beavers, Maria Damon, William J. Harris, erica kaufman, Tracie Morris, Steve McLaughlin, and Charles Bernstein. These seven were asked to listen again to the series and choose two episodes that in particular stimulated new thinking or the desire to revise, restate, reaffirm, assess, and/or commend. During this special session — presented to a live audience at the Kelly Writers House — each of the seven spoke on one episode for a first round, then a second selection of seven episodes for a second round. This was followed by a discussion of the podcast as a form with its methodological and even pedagogical aspects. 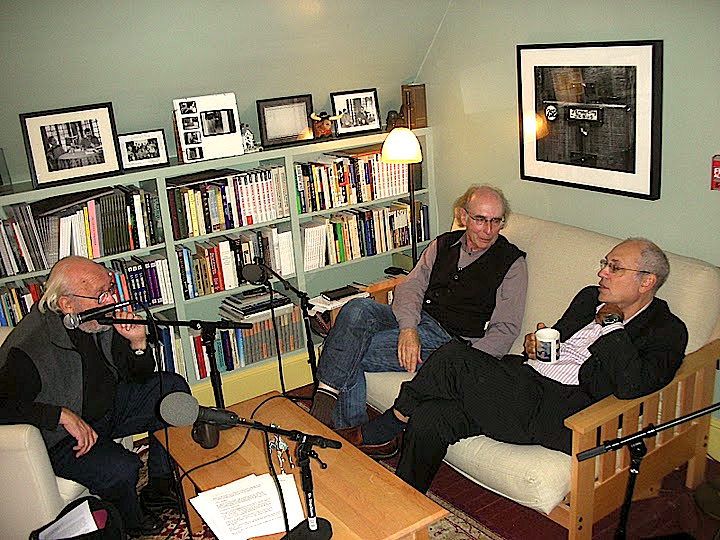 We present this special hundredth episode as an edited audio recording, in the usual format (linked here as a downloadable MP3 audio file, and available on iTunes in both the Poetry Foundation feed and that of PennSound/Kelly Writers House). We also present the full, unedited video recording of the entire event (see below). This special episode/event — difficult to capture well, and simultaneously, on various live and recording media — was expertly recorded, engineered, and then edited by Zach Carduner. At various moments during the particular retrospectives, Al Filreis gave thankful shout-outs to various people who supported and traveled great distances to join PoemTalk over the years. 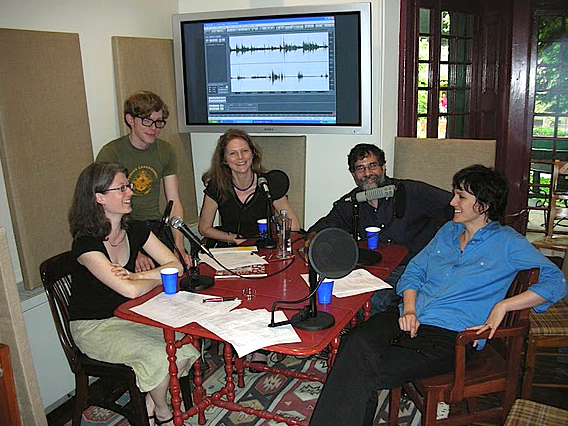 The PoemTalk people are especially grateful to our colleagues at the Poetry Foundation, who have cosponsored PoemTalk consistently and faithfully from the beginning; to the aforementioned Steve McLaughlin who recorded most and edited all of the first seventy-five episodes; to Allison Harris and Amaris Cuchanski who edited several episodes each until Zach Carduner took on the role; to James La Marre who engineered a number of episodes and made the trip to Bard College to record the special Jackson Mac Low-on-Ezra Pound episode featuring Joan Retallack, Charles Bernstein, and Pierre Joris; to the staff of the Center for Programs in Contemporary Writing and of the Kelly Writers House at Penn; to Al’s PennSound colleagues, Michael Hennessey, Charles Bernstein, Chris Mustazza, Chris Martin, and others who encourage PoemTalk as a sister project; to Rodger and Hillary Miller Krouse for their support of the Digital Poetries Fund at the Kelly Writers House; to Gary, Nina, and Freddy Wexler who made possible the creation of our Wexler Studio, which is the recording home of PoemTalk (along with nearly every other recording made at the Writers House); and to John MacDermott, Kerry Sherin Wright, and Ira Winston, among others, who between the mid- and late 1990s encouraged Al to make, organize, and archive audio and video recordings of collaborative presentations of poetry (and to stream them live). Click on the screenshot above to watch the first half of the video recording of the event. Click on the screenshot just above to watch the second half of the video recording of the event. PoemTalk commended in the "New York Times"